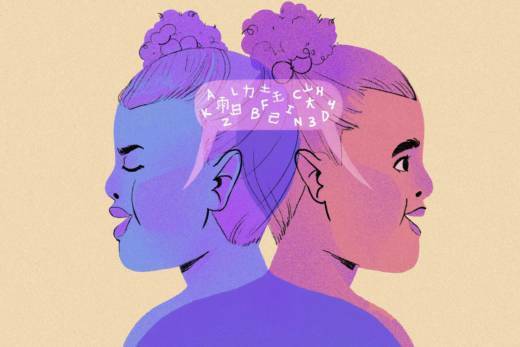 What's Going on Inside the Brain of a Bilingual Child? At the same time, one of the hottest trends in public schooling is what's often called dual-language or two-way immersion programs. The trend flies in the face of some of the culture wars of two decades ago, when advocates insisted on "English first" education. Most famously, California passed Proposition 227 in 1998. It was intended to sharply reduce the amount of time that English-language learners spent in bilingual settings. Today's scholars, like Ellen Bialystok at York University in Toronto, now say that research was "deeply flawed." "Earlier research looked at socially disadvantaged groups," agrees Antonella Sorace at the University of Edinburgh, in Scotland. "This has been completely contradicted by recent research" that compares more similar groups to each other. Saying "Goodbye" to mom and then "Guten tag" to your teacher, or managing to ask for a crayola roja instead of a red crayon, requires skills called "inhibition" and "task switching." These skills are subsets of an ability called executive function. Do these same advantages accrue to a child who begins learning a second language in kindergarten instead of as a baby? We don't yet know. Patterns of language learning and language use are complex. But Gigi Luk at Harvard cites at least one brain-imaging study on adolescents that shows similar changes in brain structure when compared with those who are bilingual from birth, even when they didn't begin practicing a second language in earnest before late childhood. Jennifer Steele at American University conducted a four-year, randomized trial and found that these dual-language students outperformed their peers in English-reading skills by a full school year's worth of learning by the end of middle school. "If it's just about moving the kids around," Steele says, "that's not as exciting as if it's a way of teaching that makes you smarter." Steele suspects the latter. Because the effects are found in reading, not in math or science where there were few differences, she suggests that learning two languages makes students more aware of how language works in general, aka "metalinguistic awareness." Some were foreign-language dominant and others were English natives. Here's what's interesting. The students who were dominant in a foreign language weren't yet comfortably bilingual; they were just starting to learn English. Therefore, by definition, they had much weaker English vocabularies than the native speakers. "This is very surprising," Luk says. "You would expect the reading comprehension performance to mirror vocabulary — it's a cornerstone of comprehension." How did the foreign-language dominant speakers manage this feat? Well, Luk found, they also scored higher on tests of executive functioning. So, even though they didn't have huge mental dictionaries to draw on, they may have been great puzzle-solvers, taking into account higher-level concepts such as whether a single sentence made sense within an overall story line. "Wayne came to our research with skepticism, thinking students ought to get instruction all day in English," says Virginia Collier. "Eight million student records later, we're convinced," Wayne Thomas chimes in. This can improve students' sense of belonging and increase parent involvement in their children's education, including behaviors like reading to children. "Many parents fear their language is an obstacle, a problem, and if they abandon it their child will integrate better," says Antonella Sorace of the University of Edinburgh. "We tell them they're not doing their child a favor by giving up their language." Specifically, among patients with Alzheimer's in a Canadian study, a group of bilingual adults performed on par with a group of monolingual adults in terms of cognitive tests and daily functioning. But when researchers looked at the two groups' brains, they found evidence of brain atrophy that was five to seven years more advanced in the bilingual group. In other words, the adults who spoke two languages were carrying on longer at a higher level despite greater degrees of damage. Thomas and Collier have advised many school systems on how to expand their dual-language programs, and Sorace runs "Bilingualism Matters," an international network of researchers who promote bilingual education projects. This type of advocacy among scientists is unusual; even more so because the "bilingual advantage hypothesis" is being challenged once again. A review of studies published last year found that cognitive advantages failed to appear in 83 percent of published studies, though in a separate meta-analysis, the sum of effects was still significantly positive. Not to mention one obvious, outstanding fact underlined by many of these researchers: "Bilingual children can speak two languages! That's amazing," says Bialystok.